Yuval Bar-Or, a Johns Hopkins business professor, playfully applies financial risk-management techniques to the management of romantic hazards in his book Crazy Little Risk Called Love. 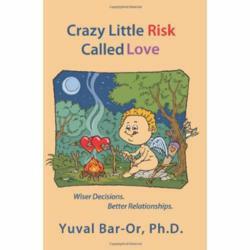 A Crazy Little Risk Called Love by Yuval Bar-Or, Ph.D.
Leave it to a business school professor and risk consultant to look at romance as a risk-management issue. But that’s exactly what Yuval Bar-Or of the Johns Hopkins Carey Business School has done in his book Crazy Little Risk Called Love. Just as a wise investor arms himself with strategies to protect his financial interests in a business deal, a would-be lover must take precautions when venturing into Cupid’s line of fire, according to Bar-Or. In listing ways to minimize risk in love, the author borrows financial concepts such as hedging and diversifying. The goal in these two approaches, he says, is to broaden the pool of potential mates and thus increase one’s prospects of finding that ideal person – by, for example, listing a broad range of hobbies and interests when completing an online-dating application, or by taking part in clubs and other social activities that attract many kinds of people. Other business concepts as bulwarks against risky romance are reflected in the chapter titles: marketing (“Put Forward the Best You”), pre-agreement pacts (“Explore Legal Contracting”), networking (“Beef Up the Friend Network”), and shrewd deal-making (“Consider an Arranged Marriage”), to name a few. Bar-Or, who earned a Ph.D. in finance from the University of Pennsylvania’s Wharton School of Business, says he got the idea for his book in 2011 while teaching a risk class at Johns Hopkins University. He observed that his students grew more attentive after he compared how financial and romantic risks are managed. He built on the theme in later classes, and from these lessons grew Crazy Little Risk Called Love. In addition to serving as an adjunct professor at the Johns Hopkins Carey Business School, Bar-Or is the founder of The Light Brigade LLC, a Maryland-based consulting company that helps its clients make better financial and managerial decisions through the management of risk. Crazy Little Risk Called Love is available at Amazon.com.